An exhaustive U.N. investigation into the history of violence in Congo has concluded that the Rwandan military and its allies carried out hundreds of large-scale killings of ethnic Hutu refugees during the 1990s that amounted to war crimes, crimes against humanity and possibly genocide, according to a confidential copy of the report. The report - which is 545 pages and details crimes committed in Congo from March 1993 to June 2003 - represents the harshest United Nations account to date of the conduct of the ethnic Tutsi-dominated Rwandan government, which has largely been credited with liberating the country from the perpetrators of the 1994 Rwandan genocide. Its release represents a political blow to Rwandan President Paul Kagame, who was reelected this month in a landslide victory that was marred by allegations of political repression against political opponents. His government denounced the U.N. findings as "immoral and unacceptable," and Rwanda has sought to block the report's release, according to U.N. sources. The inquiry, which was conducted by a team from the U.N.'s Office of the High Commissioner for Human Rights, alleges that Rwanda and its military allies carried out systematic waves of well-planned, highly organized reprisal killings against Hutu refugees in the years after they fled across the border into eastern Zaire, now known as Congo, along with remnants of the former Rwandan military. It also notes that Rwanda's ethnic Tutsi allies in eastern Congo were the target of mass killings and persecution. The report documents more than 600 incidents of large-scale killings in Congo, which it claims constitute war crimes and crimes against humanity. It notes that the "systematic and widespread attacks described in this report reveal a number of damning elements that, if proven, could be classified as crimes of genocide." "The period covered by this report is probably one of the most tragic in the recent history" of Congo, the report stated. "Indeed, this decade was marked by a string of major political crises, wars and multiple ethnic and regional conflicts that brought about the deaths of thousands, if not millions of people." The Rwandan government issued a statement Thursday challenging the findings, asserting that the U.N. investigators employed a "questionable methodology, sourcing and shockingly low standard of proof" in reaching their conclusions. "The report is a dangerous and irresponsible document that under the guise of human rights can only achieve instability in the Great Lakes [of Africa] region and undermine ongoing efforts to stabilize the region," the Rwandan statement said. The Great Lakes region encompasses Burundi, Congo, Tanzania, Rwanda and Uganda. Rwanda's foreign minister, Louise Mushikiwabo, warned U.N. Secretary General Ban Ki-moon in a recent letter that her government would withdraw from U.N. peacekeeping missions, including the U.N.-African Union mission in Darfur. The U.N. findings were reported Wednesday by the French daily Le Monde and in the New York Times on Saturday. Rwanda's former Hutu-dominated government, backed by ethnic Hutu militias, killed more than 800,000 Rwandans, primarily ethnic Tutsis, during the 1994 genocide. 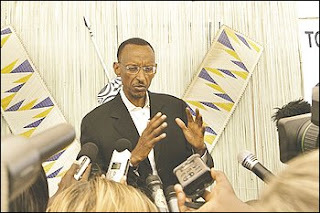 A Rwandan rebel movement, headed by Kagame, seized control of Kigali, the Rwandan capital. Many of those responsible for the mass killings, along with hundreds of thousands of Hutu civilians, fled across the border into eastern Zaire, where they continued to mount raids against the new Rwandan government. Kagame is credited with having transformed Rwanda into a dynamic economic upstart and with providing women with unprecedented rights to pursue entrepreneurial and political endeavors. But his government has been dogged by allegations, stemming from the years following the genocide, that his own forces engaged in massive human rights abuses, though on a far smaller scale than the government it ousted. Kagame maintains that his country's army has engaged in military operations in eastern Congo targeted solely at combatants responsible for perpetrating genocide in Rwanda and for subsequently mounting attacks against the country from bases inside Congo. The report acknowledges that Kagame's government continued to face armed attacks from Rwandan rebels in Congo, and that it welcomed back a massive number of Hutu refugees to Rwanda - a gesture, the report noted, that may complicate efforts to prosecute government officials for engaging in genocide. But the report includes evidence that Rwanda and its allies may have targeted and killed tens of thousands of civilians, including women, children and the elderly. The report focuses on the activities of a nascent rebel movement - the Alliance of Democratic Forces for the Liberation of Congo-Zaire (known by its French initials AFDL) - that was set up in October 1996 and headed by Laurent Desire Kabila. The group received arms, training and logistical support from Burundi, Rwanda and Uganda. While the group's stated goal was the overthrow of Zairean President Mobutu Sese Seko, its activities were "characterized by the relentless pursuit of Hutu refugees" and Rwandan rebels, the report said. The report cites numerous accounts of Rwandan army forces and members of the AFDL mounting attacks on scores of Rwandan refugee camps, often luring their victims by promising to repatriate them safely to their homes. On Oct. 20, Rwandan and Burundian army troops, backed by the AFDL, "carried out widespread and systematic attacks on eleven camps. They killed about 370 refugees the following day at the Luberizi refugee camp, dumping the victims into the latrines. Later that month, the troops killed around 220 male refugees outside a nearby Pentecostal church. "The soldiers separated the men from the rest of the group andâ€ˆ.â€ˆ.â€ˆ.â€ˆkilled them with bayonets. The bodies of the victims were buried in mass graves near the church," the report said. The U.N. first decided to set up a team to investigate human rights violations in eastern Congo in 1997, but the plan never materialized, according to the report. The U.N. revisited the issue in 2005, after U.N. peacekeepers uncovered three mass graves in North Kivu, a province in eastern Congo. In response, the U.N. decided to establish a "mapping exercise of the most serious violations of human rights and international humanitarian law" in eastern Congo between July 1993 and June 2003, and advise Congo on how to ensure some form of justice for the crimes. U.N. investigators began their work in July 2008 with the goal of amassing a large sample of cases that could expose the extent and nature of violence that occurred in Congo. The authors - who reviewed more than 1,500 documents and interviewed 1,280 witnesses - cautioned that they were not trying to establish "individual criminal responsibility, but to expose the seriousness of the violations committed." Navanethem Pillay, U.N. high commissioner for human rights, would maintain a confidential database of alleged war criminals that could be used in the event that a court is set up to prosecute them, the report said.